Lester House01263 715779work01603 870304fax Self-cateringPeriod town house with accommodation over three floors, right in the heart of Cromer. All the shops, tea rooms and restaurants are only a few minutes walk away as is Cromer Pier, the end of Pier Show is well worth a visit. With great sea views from the second floor seating area this is a super property for a relaxing seaside holiday. • Pets: One well behaved dog welcome but to be kept downstairs at all times. • Other: Linen, WiFi, books, games and highchair, travel cot & stairgate provided. Please note: Heating costs £40 per week Oct-Apr (payable on booking). Towels available for hire at £7 per person per week. • Outdoors:There is no outside space at this property. 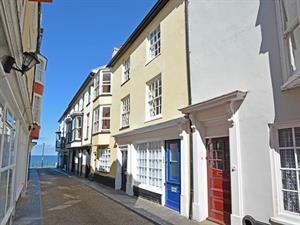 Period town house with accommodation over three floors, right in the heart of Cromer. All the shops, tea rooms and restaurants are only a few minutes walk away as is Cromer Pier, the end of Pier Show is well worth a visit. With great sea views from the second floor seating area this is a super property for a relaxing seaside holiday.